In a video which appeared on the web a BTR-82A armored vehicle is shown being floated by a landing ship. Russia’s new Bumerang armored personnel carrier is a technological marvel, which is unrivalled in the world, the head of the Military-Industrial Company, Alexander Krasovitsky, told Izvestia. Russia's latest State Armaments Program plans to give the land and airborne forces extra funds to spend on state-of-the-art weaponry. The snap combat readiness inspection involved battle tanks, infantry fighting vehicles as well as armored personnel carriers. Russia's Defense Ministry will buy a number of the latest BTR-82A armored personnel carriers fitted to withstand action in extreme Arctic conditions, a ministry source told the Izvestia newspaper Wednesday. The latest, upgraded, version of Russia’s famous BTR-82 armored personnel carrier will boast a more powerful 57 mm automatic cannon to make easy work of all existing foreign analogues and also to seriously damage or even destroy enemy tanks, the newspaper Izvestia wrote. 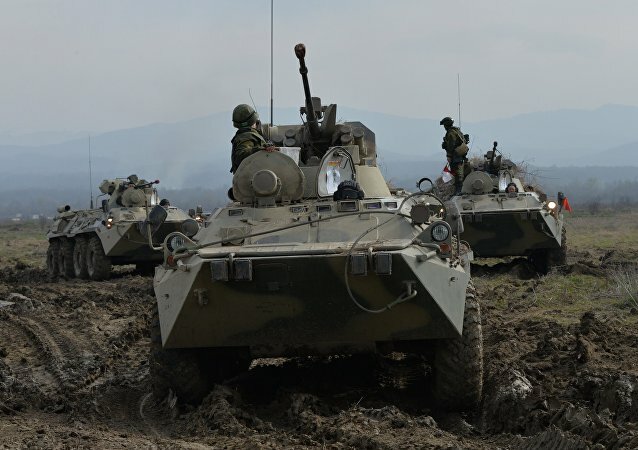 Russian troops used the BTR-82A armored personnel carriers for the first time during drills in Tajikistan, an aid to the commander of Russia's Central Military District said Tuesday. Russia's Defense Ministry has ordered 20 new BTR-82A armored personnel carriers to be supplied to the army by the Russian Military Industrial Company, the ministry said on Sunday. Russia's ongoing airborne campaign in Syria wouldn’t have been such a game changer without the help of some of the country’s most sophisticated weapons. The Bumerang - Russia’s newest armored personnel carrier, which was unveiled during last year’s May 9 Victory Parade in Moscow - is currently undergoing preliminary trials. 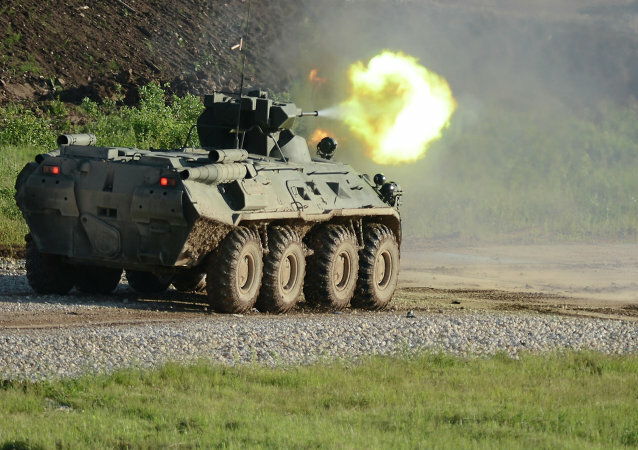 Mechanized infantry units of the Russian military base in the Republic of Abkhazia have received some 30 advanced BTR-82AM armored personnel carriers, the press service of the Southern Military District said on Friday. The BTR-82A is one of Russia’s latest 8x8 wheeled infantry fighting vehicles; its silhouette is the sole reminder of its predecessor, the BTR-80A.